The HSP provides high-speed automatic product diversion. Product may be diverted 90 degrees onto another conveyor, chute, etc. 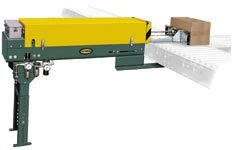 Special two-valve pneumatic control system provides smoother operation at speeds up to 45 cycles per minute. Cycle time varies with weight of product and stroke. 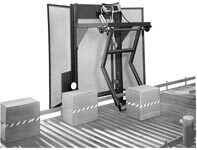 The Overhead Push-Off provides high speed automatic product diversion. Product may be diverted 90 degrees onto another conveyor, chute, etc. or changed from one lane to another in parallel lines. Overhead design conserves space next to conveyor. Pusher Stroke-available in 20" or 30"